Now, here’s an interesting question. At least, I think it’s interesting. Of course, you may think it’s a totally boring and pointless question. In which case, feel free to skip the next paragraph. And in any case, if you’re going to take that sniffy attitude, you may as well skip the entire column. I’m not going to lose sleep over it. But come back next week, otherwise I shall never speak to you again. Of course, you’ll know about Malbec grapes. Even the bloke who sells bits of roasted pig in the market knows about Malbec grapes. At one time they were grown all over France, but these days they’re far less popular. Like a faded Hollywood star of yesteryear, Malbec has rather lost some of its glitz. Except that is, in Argentina. Back in 1868, a Frenchman called Michel Pouget took some Malbec vines to Argentina. No one seems to know quite why, but it must have seemed a good idea at the time. As it turned out, the grapes thrived in the foothills of the Andes and the locals never looked back. They were so pleased with Malbec that it’s now considered Argentina’s national grape. The name “Uma” comes from an aboriginal term which means “Mother Earth”, or so it says on the label. My knowledge of South American aboriginal languages is a bit slender, so I shall have to take their word for it. 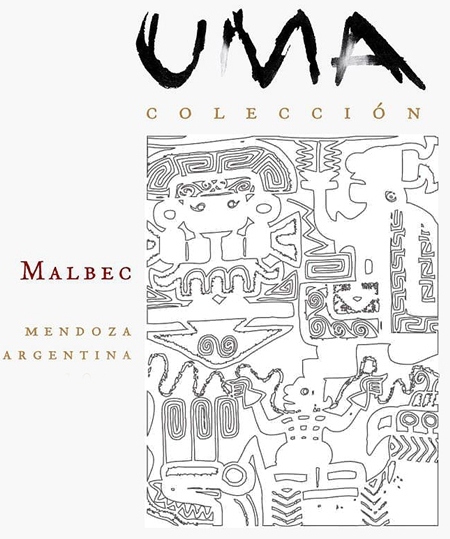 This inky-red wine is made from 100% Malbec grapes grown in vineyards over two thousand feet above sea level. It has a rich, rather brooding, jammy aroma of black fruit, blackberries, sweet black cherries and ripe plums. You might even detect hints of licorice, vanilla and black toffee. Swirl the wine around in the glass and you’ll see the so-called legs; those oily-looking rivulets that slowly stream down the inside of your glass. It was once thought that these legs were somehow related to a wine’s sweetness or quality. But they’re not. The little rivulets are caused by the interplay between adhesion, evaporation and surface tension of water and alcohol. I know it’s not very romantic, but it’s true. 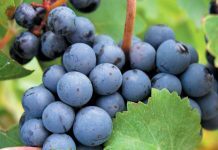 You might find the taste a bit surprising, especially if you’re new to Malbec because it has quite a different profile to Cabernet Sauvignon or Merlot. Malbecs are usually rather full-bodied with a generous dollop of acidity, tannin and alcohol content. This one is fairly typical: very dry, full of dark fruit and a rather soft, velvety mouth-feel. With plenty of ripe tannins on the palate, the fruit is balanced by a gentle touch of acidity and there’s a dry, oaky and persistent finish. If you enjoy big, firm and fruity reds, give this a try. It’s very much a food wine and would work with stews or roasted meat, especially beef, duck or goose. Serve it on the cool side (the wine I mean, not the food) and don’t forget to give it time to open up. Twenty minutes in a decanter should do the trick. 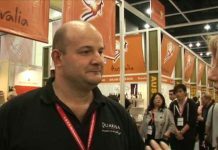 Perhaps as an expression of nationalistic fervour, almost every Argentinean wine seems to have an aboriginal name. The word “Angaro” is evidently the Mapuche name for “fire” and there’s a picture of a blazing sun on the label in case you forget. The wine is a lovely rich gold and several shades darker than I expected because of the Chenin Blanc in the blend. For some reason, the label refers to “Chenin” rather than its full name but perhaps in Mapuche, the word “blanc” means something undesirable, like dead slugs or condor-droppings. Anyway, the Chenin Blanc dominates the character: a refreshing aroma of green apples, grass and honey up front and hint of dried herbs and orange peel in the background. Actually, when I tasted this wine it was such a warm evening I decided on an al fresco tasting, because it was so much cooler outside. For a moment, I thought I could smell peppery strawberries. 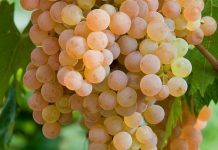 This came as a surprise, because Chenin Blanc can produce different aromas depending on its origin, but peppery strawberries are not among them. I suddenly realised that I was getting a whiff of the tastefully-scented mosquito spray with which I had doused my manly frame before going outside. It just goes to show how easily the nose can be deceived. It has only just occurred to me that you might have spent half a lifetime searching for a wine with the aroma of peppery strawberries, in which case I am terribly sorry if I raised your hopes unnecessarily. I really am. Anyway, the wine is light-bodied with a typical slightly tart mouth-feel and attractive zing of acidity. There’s a good bit of tangy citrus and pineapple on the palate and a pleasantly dry finish. It’s not quite bone dry but it’s pretty close. It would make a good apéritif to kick the taste-buds into action but I think it would be best with food. Chenin Blancs tend to work well with poultry of seafood as well as spicy Thai and Japanese dishes. If you’re serving it with dinner, try to sneak a bit away for the cheese course because it would go a dream with the Camembert. Oh, and I’m really sorry about the peppery strawberries. I hope it hasn’t thrown you into one of those fits of depression. Perhaps you should have skipped this column after all.